UPDATED: Website Maintenance - November 2007 - Part 2. UPDATED - First reports confirm that the data storage facility move was completed successfully. There have been no negative effects to sellers or to buyers and all services should be working properly. Should this change, please be assured that we will keep you updated. We are writing to inform you that the final stage of our data storage facility move will take place in the erarly hours of Friday 30th November 2007. This move will result in a site outage of approximately 1 to 3 hours duration, beginning at 03:00 a.m. GMT. During the outage, users will experience varying levels of site functionality. As with the first phase of this move, there is also the possibility of intermittent site issues immediately following the outage. Please check the Site Performance category on the Bookseller Digest Blog regularly, as we will be posting updates throughout the course of the process. If you have any questions or concerns, please feel free to contact Customer Service Team. We provide support from Monday to Friday: 08:00 a.m. - 17:00 p.m. GMT. We apologise for any inconvenience this move may cause and thank you kindly for your patience. Our Security & Trust Team would like to remind all booksellers to beware of potential 'phishing' scams. These scams usually take to form of enquiries about or requests to place orders outside of the AbeBooks system. They often involve requests for bank account information under the guise of making payment by 'bank transfer.' Most recently, we have received reports of buyers requesting this information so that 'a friend' who owes the seller money can make such payment. AbeBooks fraud protection applies only to Visa and MasterCard purchases that are placed through the AbeBooks checkout. For your own protection, we recommend that whenever you receive such requests, you respond to the buyer and ask that they place their order online. A legitimate buyer will have no trouble with this request and a fraudulent one will likely not respond. We also recommend that you never provide bank account information to anyone in response to such requests. We are happy to confirm that this issue has now been resolved. You should now be able to upload all files without any difficulty. Should you notice any problems, please do contact our Customer Service team with the details. It has come to our attention that somes sellers are experiencing intermittent issues preventing them successfully uploading their book files. Please be assured that we are aware of this and are working to resovle the issue as soon as possible for you. We will keep your posted as to any updates as soon as they come in. In the meantime, we thank you for your patience and understanding. This month we are pleased to present the second in our series highlighting AbeBooks subsidiary companies: who they are, what they do and how they can help you! This month’s featured subsidiary is BookFinder. BookFinder.com is a one-stop ecommerce search engine that searches over 125 million books for sale — new, used, rare, out-of-print and textbooks. Who are BookFinder? BookFinder.com was launched in 1997 by then-19-year-old UC Berkeley undergraduate and current CEO, Anirvan Chatterjee, and was subsequently acquired by AbeBooks in 2005. The BookFinder.com website is part of the BookFinder.com/JustBooks network, produced by a team of high-tech librarians and programmers based in Berkeley, California and Düsseldorf, Germany. What is BookFinder? BookFinder.com is a one-stop ecommerce search engine that searches over 125 million books for sale — new, used, rare, out-of-print, and textbooks. BookFinder saves buyers time and money by searching every major catalog online, and letting them know which booksellers are offering the best prices and selection. Where does BookFinder find its search results? BookFinder.com partners directly with major online listings services and bookstores, aggregating the inventories of well over 100,000 booksellers worldwide. How does BookFinder work? Book buyers can search and compare prices on over 125 million books listed for sale online. Search criteria include title and/or author, and the language the book is written in. Further search refinements include new, used, first edition, and signed copy. Search results are sorted lowest price to highest, and prices shown include standard shipping. (The shipping destination is customizable, as is the currency displayed.) Each book in the search results links directly to the listing on the originating site. AbeBooks provides an up-to-date search API to BookFinder, thereby ensuring that your listings can be found through this additional channel. As long as your books are priced competitively, BookFinder will make sure its users can find your listings. Take a look at your inventory to ensure that you have got the best items you have available as gifts this Christmas. We have put together some best practise tips to help you prepare for the run up to Christmas. Add pictures: When it comes to gift giving,buyers like to see what they are buying. You can easily upload photos through your Members Menu. How can I upload pictures? Carefully describe your books: Your description is your chance to showcase your books to potential buyers. Help them to understand your book by including detailed condition information and storylines or synopses. Include an ISBN for ISBN-books so we can add synopses, reviews and other important information to your listings. Book Description Tips. Use keywords: Include descriptive keywords with your listings such as themes, subjects, and in some cases, main characters. Remember that your books are presented globally, so include translated keywords as well. English - French - German Keyword Translations. Check our Books-Wanted list: Every day buyers who can not find the books they are searching for, leave us Wants. Thousands of anxious buyers are waiting for a match. Check the list regularly so that if you have a match, you can upload it right away. Review your Shipping Matrix: Shipping costs and accurate delivery times are important to gift-buying customers. Be sure to adjust your shipping to reflect accurate and competitive delivery speeds and shipping costs - you might want to look at offering free domestic shipping for the run up to Chrismas. Take a look at the Royal Mail website to familiarise yourself with final postal dates before Christmas, and ensure that you are prepared for that. Send books via trackable means to ensure that you and the buyer are covered if a book gets lost along the way. The second phase of the AbeBooks data storage facility move is scheduled to begin this week. The timeline and expected impact to users of the site are outlined below. Between 14th and 23rd November, we will be physically moving our data storage equipment to a new location. Since the site has not been running out of this location since the first phase of the move on 23rd October, we are expecting that there will be no impact to users of the site during this time. During the first week of December, we will be moving actual data to the new storage facility. This will result in a planned site outage of approximately 1 to 3 hours, very similar to the outage of 23rd October. The date of this outage is yet to be determined but we will keep you updated, both by email and on the Bookseller Digest Blog. As with the first phase of this move, there is the possibility of intermittent site issues during the move, particularly immediately following the site outage. Please ensure that you check the Bookseller Digest Blog regularly, as we will be posting regular updates throughout the process. We sincerely apologise in advance for any inconvenience caused by this move. The new facility is a significant upgrade that will improve both site stability and performance, which will be of benefit to everyone. Refunds - are you in the know? Did you know you can save money on refunds by ensuring that you are completely aware of the AbeBooks refunds guidelines. Entering the correct return reasons when processing your refunds may help you to control unnecessary refunds from being processed and essentially save money in the long run. ALWAYS check what options are available carefully before updating a refund. Be careful when updating refunds for orders where the buyer needs to return the book first. If you do not receive the book and therefore click to "disagree" - the system assumes you have received the book back, and the refund will be completed minus the return shipping. Take a closer look and you will see that you can actually report a missing shipment, which will hold off the refund until we have investigated with the buyer and got any available tracking information for you. To avoid refunds for the reason [Item Did Not Arrive] - ship via traceable means (Find out about Royal Mail Tracked). If you enter the tracking number of an order, you can prevent refunds from being processed unnecessarily. Once you have processed an order you can always go back and update that order with a tracking number if available. Click Here to find out more. 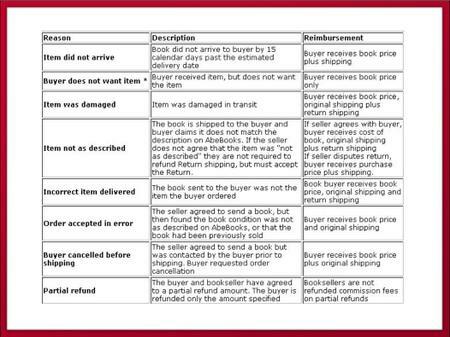 Ecommerce refunds should be processed via the AbeBooks system. If you refund a buyer directly, you run the risk of the buyers being refunded twice. Update 5.45pm: The issue described below has been resolved. You can again access your orders via the link in the order notification email. You may receive an error 500 message when clicking on the link in the AbeBooks order notification email today. We are currently investigating this and kindly ask that in the meantime you process your orders via your AbeBooks account members menu.